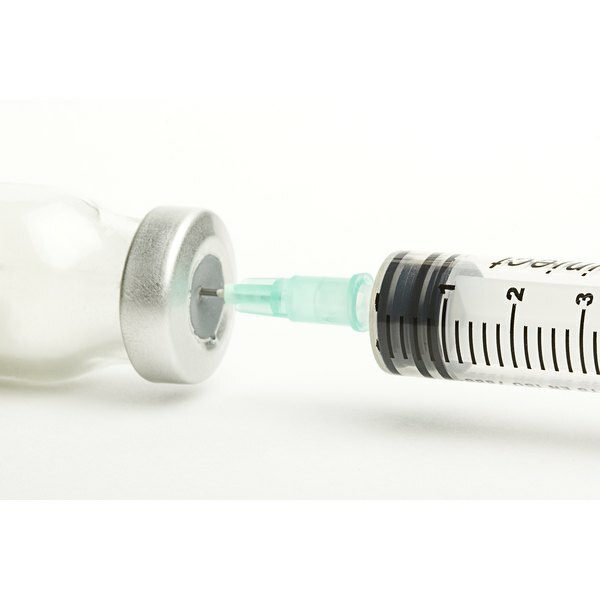 How is a B12 Injection Given? Fentanyl is a prescription drug derived from opium, and is used to treat pain in certain cancer patients. The drug is primarily used for its analgesic and sedative effects. The effects of Fentanyl last usually form 30 to 60 minutes, says Drugs.com. It can be injected straight into a muscle, but is often delivered into the bloodstream for an immediate effect. Wash your hands carefully with soap and put on latex gloves. Prepare all the material on a clean surface. Tie a strap around your arm to cut the flow of blood. Wait until you spot a vein you can inject in. Any clearly visible blood vessel on the surface of your lower arm is usually a very good spot to inject in, but you can also use your upper arm for injections. It is important for you to change the arm and spots where you inject in between shots to avoid causing any damage to your veins. Clean the area you will inject in with an alcohol pad. Fill your syringe with the drug by plunging the needle into the vial, turning the container upside down and gently flicking the vial to remove any air from the container. Pierce the skin with the needle at a 45- to 90-degree angle and inject the drug in a slow, steady stream. Be sure to always inject in the same direction as the flow of blood, which is always towards the heart. Draw the needle back out, clean the area again and bandage it. Keep your Fentanyl stored in a cool, dry place. The temperature at which you store the drug at should not rise above 86 degrees F.
It is possible to overdose on Fentanyl, so make sure you know how much and when you inject. Contact your local emergency services if you experience muscle spasms, slowed breathing or a bluish color on your skin.